Project obstacles and solutions: The Lentz Public Health Center is a public/private building partnership between the City of Nashville's Metro Public Health Department and the Hospital Corporation of America (HCA). The three story, 106,000 square foot building will house 300 employees from the Health Department and serve numerous public health needs. The structure is designed to meet LEED Silver certification. The original design of the parking lot called for asphalt pavement. However, to enhance the LEED Silver certification, the architects and engineers switched to a roller compacted concrete pavement (RCCP). Four Star Paving had been contracted to place the asphalt and had never been involved in a RCCP job prior to this. This was also the first time that the City of Nashville had used RCCP. 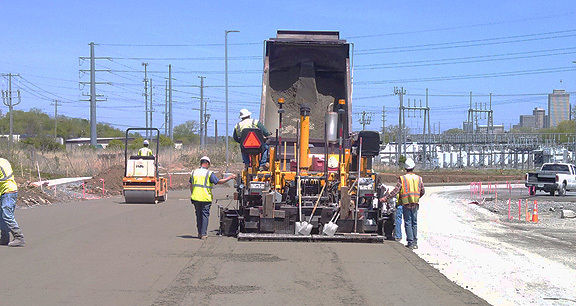 When the change order was made, they turned to IMI for their expertise with imix Roller Pave roller compacted concrete. IMI Concrete QC/QA personnel met with Four Star's management, the engineers from the city, and architects/engineers from Gresham Smith and Partners. IMI QC/QA personnel discussed the methods used to test and place RCCP, as well as monitoring moisture and aggregates. Testing, moisture ratings, adjusting for the ambient temperature and the sealing process are all very different from regular concrete. IMI was able to educate the key players and help facilitate a plan to move forward on the project. RCCP is typically used where there are heavy loads, such as semi traffic or large industrial equipment. imix Roller Pave can have compressive strengths that exceed 10,000 psi. This project was different in that aspect. Curtis Smith from Gresham Smith pushed the idea of using imix Roller Pave for its sustainability rather than its strength. RCCP resists freeze and thaw cycle damage that would require normal pavement to be patched and replaced every few years. Because of its very dense composition, imix Roller Pave allows very little moisture to penetrate its surface. According to studies done by the National Ready Mix Concrete Association (NRMCA), it is not uncommon for RCCP to last in excess of 20 years without any major maintenance. Key to this project working was the cooperation of RCCP experts. IMI arranged a meeting with Mike Maynard, the president of Four Star Paving and E&B Paving from Anderson, IN. E&B has been a leading paver of RCCP throughout the midwest. Because of the breadth of service areas, IMI was able to make this connection for Four Star. Since this was the first use of RCCP in the Metro Nashville/Davidson County area, Maynard committed to educating his personnel in Best Practices for paving and testing the material. Four Star placed 3,000 yards of imix Roller Pave roller compacted concrete in the parking lot of the Lentz Building. For more information on imix Roller Pave, click here.